Welcome to Your Deck Company – Brooklin. Since 1986 we continue to be your local custom deck builder. Your Deck Company is a custom deck builder servicing Brooklin and the surrounding area. We specialize in artful deck design and construction. For over 30 years, Your Deck Company has been your trusted source for a deck builder in Brooklin. While we offer you a full complement of decking services and products. We also make the process of building a deck, as simple as possible. From concept to completion, we take the guess work out of building a custom low maintenance deck in Brooklin. At Your Deck Company our commitment is to offer you exceptional service, quality materials and experienced craftsmanship. Unique Custom Decks in Brooklin, Ontario. At Your Deck Company, as a deck builder in Brooklin, we also offer a wide variety of decking materials. However, almost 98% of our projects use low maintenance decking. Due to, this high percentage, our specialty is the design and construction of low maintenance decks. Your Deck Company is also registered as a TrexPro Platinum level installer. Furthermore, we are the largest installer of Trex decking in Ontario. We are also a TimberTech Gold level installer. We want to make the process of building a deck fun and worry free. Our goal is to create artful deck designs that suit your lifestyle and budget. However, we only want to offer the best available materials. Through our research and experience, we consider capped composite decking materials to be the best overall consumer choice. A few capped composite brands are Trex, TimberTech, Fiberon and Deckorators. However, while, we do offer PVC decking materials such as Azek, Wolf, Gossen and more. PVC decking is not our first choice as a premium decking material. Yet, if you think you may want a more traditional decking material such as Cedar or Ipe? We also offer those decking materials too. However, due to its poor performance, we do not offer pressure treated lumber. 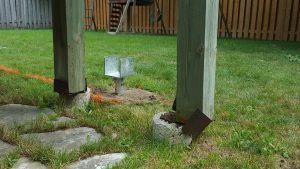 Since you are considering building a deck in Brooklin, Ontario, don’t bother with concrete foundations! Due to frost heaving when using concrete, Your Deck Company only uses GoliathTech helical screw pile foundations. Because of its extremely high quality, we consider GoliathTech to be the only choice for a deck foundation today. As the industry leader, GoliathTech helical piles are building code approved for use in Brooklin. Additionally they are fully ACQ approved for use with treated lumber and will never heave due to frost. And while there are many manufacturers of helical screw piles. In our opinion, none compare to the quality of GoliathTech. Contact us and find out more today! Trex deck over a walkout basement in Brooklin, Ontario.